WorldMovieStore - Casablanca Sinopsis. As time goes by, one of the best-loved films ever made. Humphrey Bogart is cafe owner Rick, Ingrid Bergman lost love Ilsa, and Paul Henreid resistance leader Victor. Their lives and destinies come together in the exotic Moroccan city. Winner of three Academy Awards, including Best Picture. With Claude Rains, Conrad Veidt, Dooley Wilson, Peter Lorre, Sydney Greenstreet; Michael Curtiz directs. 102 min. Standard; Soundtrack: English; bonus documentaries; featurettes. Anniversary limited edition comes packaged with a disc of documentaries including "Jack L. Warner: The Last Mogul" (1993), plus a full-size original poster reproduction, 62-page book, and four collectible drink coasters. Also includes a DVD version of the film. Three-disc set. Read More Sinopsis. 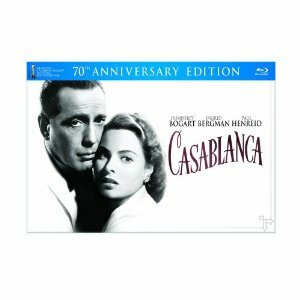 0 Response to "Blu-ray Release Casablanca"